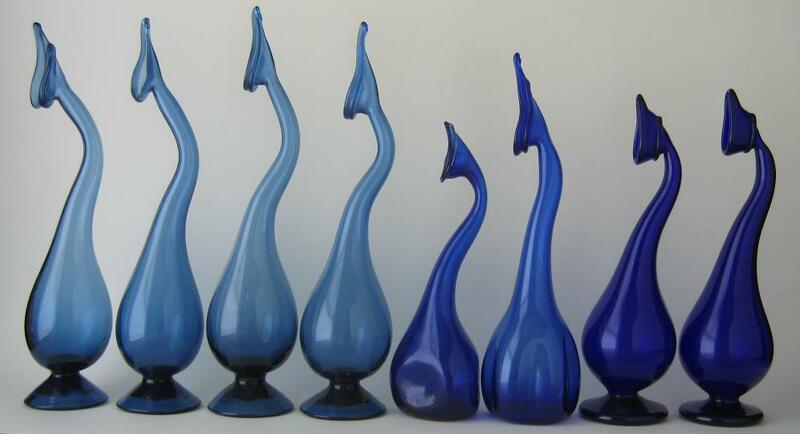 Each of these nine perfumed water sprinklers or tear catchers (eight are shown) is of hand-blown blue glass of varying hues. Each has a smooth globular body and an elongated neck with a broad tear-shaped rim. Seven rest on splayed foots. The recessed bases have pontil marks. The glass has many tiny bubbles. Such vases were blown in a dip mould. Tiny bubbles are present in the glass. Sprinklers of similar form are in the corning Museum of Glass, the Victoria & Albert Museum, the British Museum and Copenhagen’s David Collection. There is some debate as to the purpose of these vessels. The V&A remarks that “It has been romantically and completely falsely suggested that such flasks were used by the Sultan’s lonely concubines in the Harem to collect their tears; the shape is probably intended for sprinkling rosewater or similar perfumes onto the hands.” Another version of the story is that the flasks are tear catchers used at funerals by widows to collect their tears, and then buried with the body of the husband. The V&A says that such flasks often are dated to the 16th and 17th centuries but that there is “no evidence” that they were made before the 19th century. Certainly from 1400 onwards glass making in the Middle East declined in the face of competition from imported Venetian and Bohemian glass and in the 19th century there was an attempt to revive glass making in Persia. These examples probably date to around 1900. A sprinkler of similar form is in Folsach, K., von, Art from the World of Islam: in the David Collection, 2001, p. 223. And in Loukonine, V., and A. Ivanov, Persian Lost Treasures, Mage Publishers, 2003, p. 230. And Carboni, S., and Whitehouse, D., Glass of the Sultans, The Metropolitan Museum of Art, New York, 2001, p, 290-2.